Thanksgiving is a great time of year to contemplate what we are really grateful for. I know we should have a heart full of gratitude all the time, but I like the reminder we get every November to stop our busy lives and just be thankful. Sometimes our kids don’t see it that way though. For kids Thanksgiving can be a boring day of trying to be patient while waiting for a huge dinner (of which they will just eat the mash potatoes) and all that is on the TV is football. Oh wait! That was my childhood memories of Thanksgiving. hahaha. 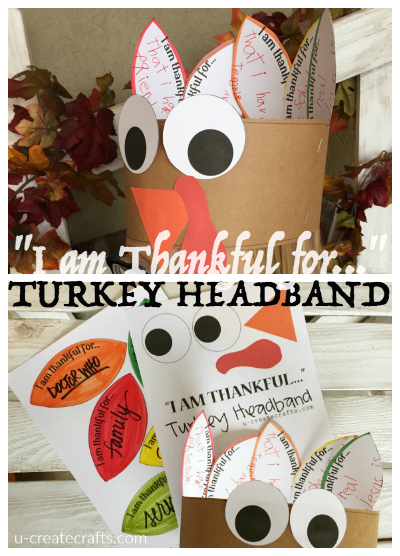 So that being said, this Thankful Turkey Headband would be the perfect kid’s craft to keep the little ones busy while they wait. 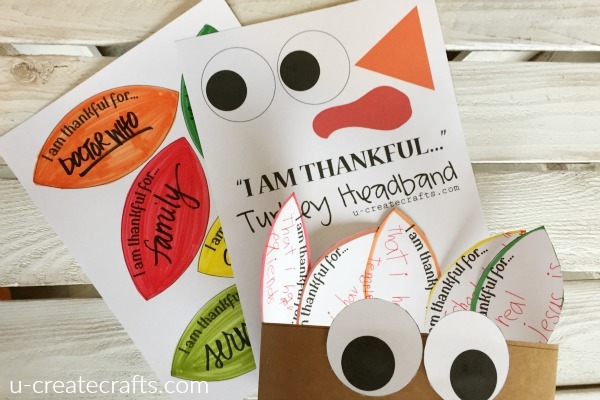 It’s also a fun way to keep gratitude on the mind of the little ones. Step #1: Download printable and print out all three pages. Page 1 is the feathers, page 2 in the two piece headband, and page 3 is the accessories. Each completed headband takes one of each page…or more if you’d like more feathers. I printed the headband (page 2) on Kraft paper or light brown cardstock. Then print the other 2 pages on bright white cardstock. If you are planning on making out a lot of these (like for a school or church gathering or big families), it might be a good idea to print the feathers on colored paper. Print a page of red, orange, yellow, green, etc. That way you would have plenty of feathers in every fall color. Step #2: Write on the feathers. This process is quite heartwarming and cute. I had fun watching my daughter think about what she is thankful for and revealing what is inside her grateful heart. My little one is learning to write so I had her write the words herself, but you could easily be the scribe for the tiny kids…or put an older one in charge of that. Step #3: Cut out and assemble headband. 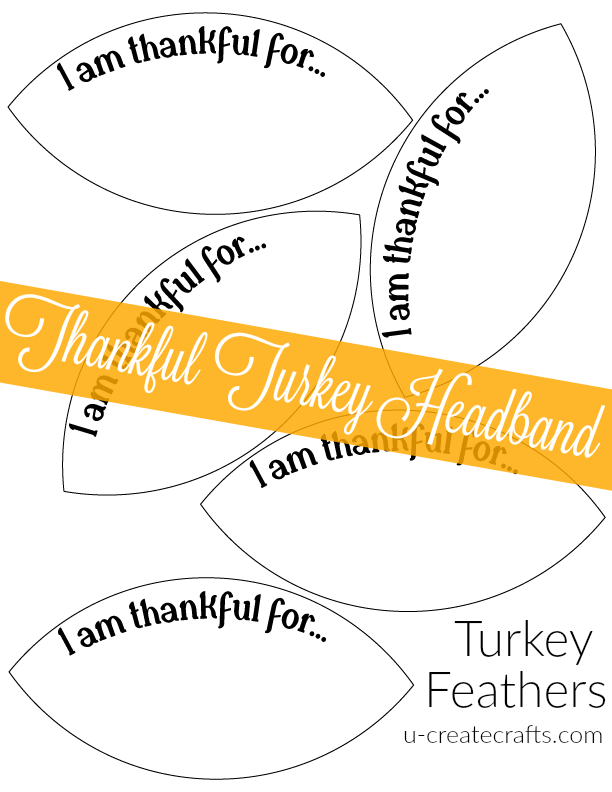 Once my daughter and I made the headband we notice it was too wide; cut the rectangles in half long wise and that will make 4 skinny bands. Assemble them together around the child’s head. On the headband you will see little x’s. This is the front of the headband and those x’s are where you glue the eyes and beak. Glue these pieces on before you staple the headband together. 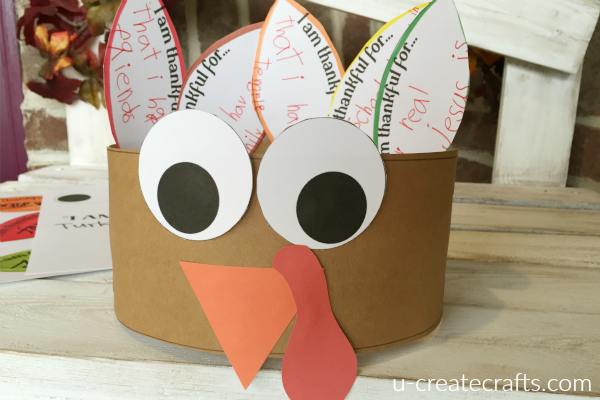 Now everyone is adorned with what they are thankful for and ready to eat an amazing dinner. 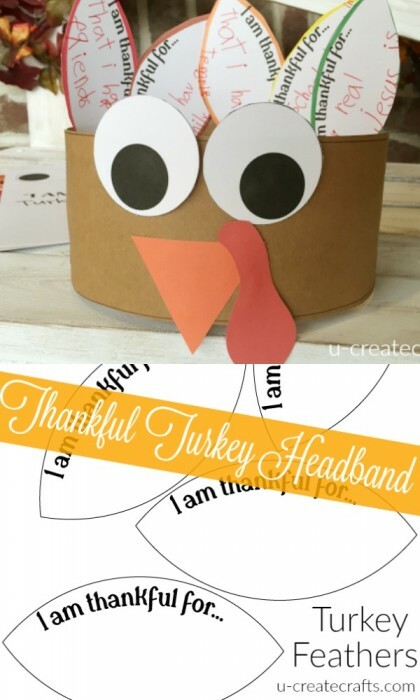 When you make this cute thankful headband, share a picture with us on Facebook or tag us on instagram @ucreateblog. Most importantly: have a wonderful Thanksgiving!! When I print on the templates to print out they are not on a white background. They have a gray ad white checked background. Am I missing something obvious? The grey and white background just means there is an invisible background. 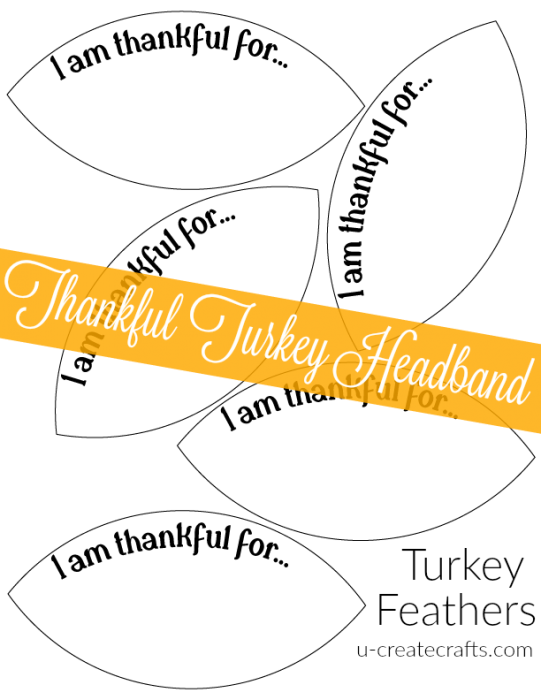 How do I download the turkey headband?